Cowboom Discount Code, Groupon & Staples Deals & More! This is one of our Great Deals posts. These posts are limited time offers. To receive Great Deals posts like this one direct to your email in real-time, subscribe here. Good morning! I found a number of deals and discounts that I feel worthy of your time. Lets take a look! Amazon is offering 25% off any book with a maximum discount of $10 through 12/14. To get the discount, simply use the code BOOKDEAL25 at checkout. The deal is only good for print books sold directly through Amazon. You can find the full terms of the deal here. Card Cash is offering an additional 4% off select gift cards with the code 4MOREOFF through 12/15. Groupon is back with another discount on local deals. From now until 12/13 you can get 20% off any local deal up to a total discount of $50 with the code GIFT20. The code can be used three times per account and you can go through a portal for additional savings. I just searched and plan on purchasing a Go San Francisco card for my upcoming trip. It provides access to a number of tours and museums we are interested in. I almost always use Groupons when traveling, especially for discounted admissions and sometimes for food as well. 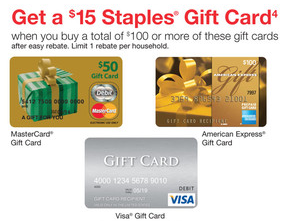 This is just a reminder that Staples is offering a $15 rebate on the purchase of $100 or more in Visa, Mastercard or Amex gift cards through tomorrow. You can find the full terms and details here. If you are already heading to Staples, they are offering 15% off of one regularly price item through tomorrow as well. I have often found this coupon applies to items which are on sale, but that of course is YMMV. You can find the printable coupon and full list of exclusions here. Cowboom is a company which sells used and refurbished electronics. They are owned by Best Buy and often have deeply discounted prices. Through the end of the day, they are offering 20% off when you use the code HOLIDAY2014. There are a number of good deals depending on what you are looking for. Since some of the items are used, always check which accessories are included as well as the item condition. I have purchased several items from them in the past without issue. You can save even more by going through a portal. Hopefully one of these deals will save you some money. I am personally buying a few Groupons and heading to Staples today to recycle some Ink, buy some gift cards and save 15% off a computer mouse! Happy Friday. Previous articleSecret Wells Fargo Checking Bonus – How to Make an Easy $200 By Opening an Account!